Stress is experienced in many parts of the body; it’s not just a state of mind. Stress speeds up the aging process and suppresses the immune system, making you more vulnerable to disease and robbing your birthright to a good quality of life. Are you motivated to looking at the stress in your life so you can bring it under control? Headaches, IBS, insomnia, brain fog, high blood pressure, palpitations, and frequent colds are just some of the physical byproducts of chronic stress. We need our bodies to step up and react to real stressors when they present. 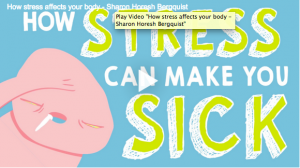 The damage of prolonged, unrelenting everyday stress wreaks havoc on your body, which is beautifully illustrated in this video. Think about the stresses that trigger you daily and whether you can make changes in you and around you that help bring things down a notch or two. Experience what it’s like to live in a little more calm for a little while and see if that suits you better. Some lifestyle changes like adequate sleep, quiet time alone, cleaning up the diet, and exercising regularly are just some things you can imcorporate into your life. There are a few things I do to jump-start me back into a calmer state and one of these is acupuncture. Acupuncture has a modulating effect on neurochemicals of the nervous and endocrine systems. The brain calms down, naturally quieting thoughts and smoothing emotions. This simply feels good.